The Wolfenstein games are set in an alternate reality in which the Allies lost World War II and the Nazis emerged victorious. 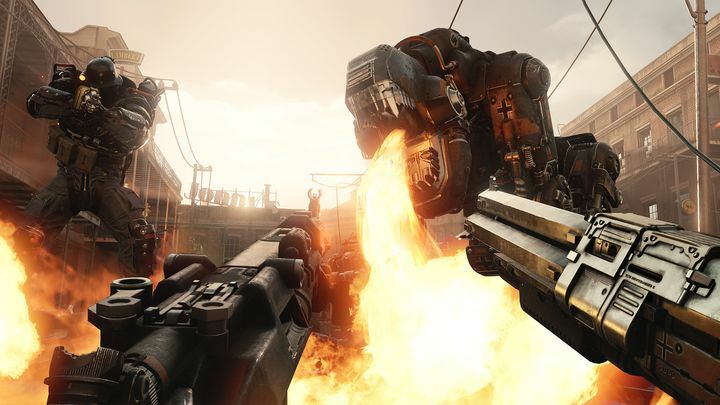 It’s an alternate-history scenario that’s been explored by books and movies before, and which obviously is also a good setting for a first-person shooter game as Bethesda’s Wolfenstein games have proved to date. So it’s logical that many are waiting for Wolfenstein II: The New Colossus with anticipation, this being a sequel to 2014’s pretty great Wolfenstein: The New Order. This was an old-school action game with oversized guns, an even bigger hero and plenty of Nazi scum to wipe off the face of the Earth. What makes Wolfenstein II arguably more interesting than its predecessors is the fact that it takes place in America, and it will no doubt be exciting to liberate the land of the free from its Nazi oppressors in Bethesda’s latest game (assuming this Wolfenstein game does live up to expectations, that is). Also, the trailer gives away some story details, plus there’s a surprise at the end, revealing that Nazi leader Hitler will be making an appearance in this game (he was referred to in earlier Wolfenstein games, but did not actually show up). It’s also obvious by this trailer that this could be one of the best-looking games released this year, and hopefully the game’s first-person action gameplay will live up to that of Bethesda’s earlier Doom game, one of the best action games to hit shelves last year.